"Pieces from such authors as Stephen Coonts, Hallie Ephron, Robert Goolrick, Wade Rouse, Mahbod Seraji and Donna VanLiere have already been posted. The upcoming lineup will include guest blogs from Sandra Brown, Sandra Dallas, Barbara Delinsky, Jamie Ford, Kristin Hannah, Marcia Muller and Lisa Scottoline --- plus many more! The Bookreporter.com feature will be updated through Christmas Day." This is one of my favorite sites, and I read it regularly, so I hope you take the time to stop by. 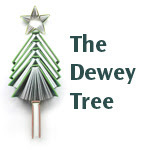 Lisa Roe, known as Online Publicist, has a special project right now, The Dewey Tree. Here's some information about it, from her site, and then I'll link directly to the Dewey Tree page. *Gather up the books you can live without. It can be 4 books, 10 books, or 20 books! *Find a worthy group you would like to donate your overflow books to. It can be your local library, a literacy campaign (mine will go to the literacy center I volunteer for), or overseas. There's a great list of book donation sites here on the ALA. Find a charity that speaks to you! *Then take a picture of your donation and email it to me (onlinepublicist [AT] gmail [DOT] com). It can be a pic of the mailing label on your package, one of your kids giving a box of books to a librarian, or you handing books over to your literacy center. Be creative and have fun! "I will accept pics (and will post favorites) until January 4, 2010. At that time, I will enter the names of all who sent donation pics into Random.org and choose three. Those three winners will receive custom made totes from me! I will email you pics of my available fabric and have you build one you like. "And here is the official The Dewey Tree donation project button! Please help me spread the word (and the button!) to bring our book blogging community together in the spirit of spreading the love of reading." Check out Lisa's site to see pictures of some of her bags, and find out information for submitting your pictures. Here's the link, http://onlinepublicist.blogspot.com/2009/11/dewey-tree.html. Lesa, thanks for these tidbits! I'm not familiar with these sites and am checking them out right now. Thanks. Great links Lesa. The Dewey Tree is a wonderful project. Thanks for the post, looking forward to tomorrow's. I love Lisa's Dewey Tree project and have been getting my gently read books together to give to a local charity. I absolutely must check out the bookreporter.com --- it sounds like a very worthwhile site. You're welcome, Elizabeth. And, after tips, back to some book reviews next week! Thanks for checking in Mason. And, I promise more book reviews next week. That's terrific that you're participating in the Dewey Tree Project. Oh, you're going to like Bookreporter.com.